The Ballet House is back! This time it’s on full view from the lower level to the attic. Free with your ticket – special 30-minute guided tours led by seasoned NWSS drama students playing the roles of first homeowner H.T. Kirk and second owner, Josephine Slater, principal of the home’s ballet/dance school where generations of local students learned to dance. Tours run from 9:45 to 12:30 – pre-booking required when you buy your ticket. Regular viewing from 1:30 – 5:00 pm. Neighbourhood guided walking tour led by Stephanie Watts of New Westminster and Vancouver Walking Tours and Ghostly Tours fame. Ticket holders meet at NWHPS’s Welcome Centre at Tipperary Park to enjoy one of three 45-minute afternoon guided tours. NWHPS Welcome Centre – view a visual history of the longest running heritage homes tour and NWHPS merchandise favourites for sale. Women’s Exhibit – a curation of photos and period pieces highlighting the lives of early residents, including several remarkable women from New Westminster’s past. For ticket holders, three of the homes on this year’s Homes Tour each feature a display highlighting the remarkable woman who once lived there. Tickets: $35 / $25 for NWHPS members. Buy Tour Tickets online Now! As a member, you can purchase as many ticket guidebooks as you need at your member price of $25 – a savings of $10 per ticket. It’s just our way of saying ‘Thank you’ for helping us celebrate 40 years of stellar homes tours. You can buy your membership online, anytime. We will mail your complete ticket guidebook to you for a flat fee of only $5, regardless of how many you order. You also have the option to pick up your ticket guidebooks at no charge at Royal City Colours, 700 Twelfth Street, New Westminster. Please note: This year, ticket guidebooks will be sold only at Royal City Colours. In 1980, a small group of residents created the New Westminster Heritage Preservation Society to educate and inspire visitors and residents to save. not demolish. 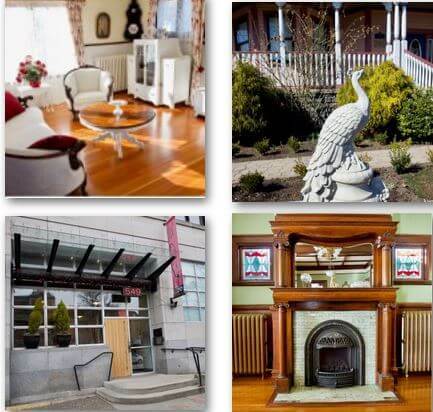 the Royal City’s rich inventory of historically and architecturally significant heritage buildings. What better way to start than by opening the doors to five beautiful, functional historic residences on May 24, 1980? Forty years later, we can look back with pride at the grandmother of all home tours in Canada. Our annual event has attracted thousands of visitors and residents alike to glimpse New Westminster’s ‘built’ past and its current contribution to the City’s economy, sustainability, culture and aesthetic appeal. This entry was posted on Wednesday, March 20th, 2019 at 4:56 pm and is filed under Heritage Homes Tour, Homes Tours, News and Events. You can follow any responses to this entry through the RSS 2.0 feed. Both comments and pings are currently closed.